Sorry, we are currently sold out of 'Colombia Granja Esperanza Tekisic'. Please check back later. Arrived January 2016 in grainpro bags and being offered for the first time in September. Tekisic is an offshoot of Bourbon that was developed by the Salvadoran Institute for Coffee Research over a nearly 30 year period and the first seeds were released for production in 1977. The variety is known for intense sweetness and significant body. It is primarily grown in El Salvador where it was first planted rather extensively but has also become a viable economic coffee variety in Guatemala and has now made its way to Colombia at Granja La Esperanza. 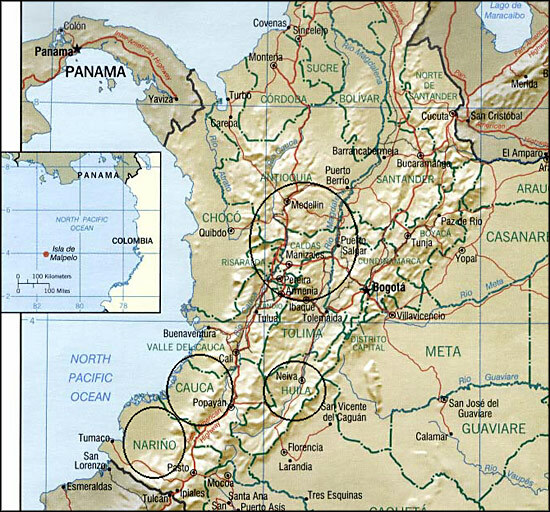 It grows optimally at elevations over 1300 meters and the Las Margaritas farm is significantly higher. The name Tekisic comes from tekiti, a word meaning “work” in Nahuatl, an Aztec language. Cafe Granja La Esperanza manages 3 farms: Cerro Azul, Potosi, and Las Margaritas in eight distinct microclimates located in three mountain ranges in Colombia, which gives the experienced agronomists behind Cafe Granja La Esperanza plenty of room to experiment with a number of variables, such as microclimates, processing methods, and varietals. The team at Granja La Esperanza is driven by a combination of science, business, and an obsession with quality coffee. The team creates milling and processing protocols tailored for each distinctive microclimate and varietal. This particular coffee comes from the Las Margaritas farm in the Valle de Cauca region and is a type of Bourbon variety called Tekisic which originated in El Salvador. The farm has under 100 coffee trees spanning about 33 hectares and 13 total lots. The staff is so dedicated to quality and research that they recently spent two years studying the famous Geisha varietal in Boquete Panama, on a property adjacent to the famed Peterson Esmeralda farm, before becoming the first producers to bring the varietal to Colombia at their Finca Cerro Azul in Trujillo. Their dedication to quality goes so far that coffee harvesters must demonstrate a level of excellence during a five month training period before being qualified to pick the Geisha cherries at the peak of ripeness. In addition to winning the Triple Crown Award at SCAA in 2012, coffees from Cafe Granja La Esperanza were also used in competition by the winners of the Brewer's Cup and Roasters Choice Awards. Their hard work was described as "an unrelenting quest to steadily obtain the most perfect cup of coffee" and this coffee is proof of their success in this quest. Cup Characteristics: Lovely aroma of milk chocolate and raisins. Big body, black cherry flavors and intense sweetness.Unctuous and smooth. Roasting Notes: High grown, hard and durable coffee can be roasted throughout the light to dark spectrum. It will display its acidity and refinement best when roasted more lightly, about 2/3 of the way between first and second crack. Stretch out the time between cracks to expand the body if desired. Can be dark roasted but you will sacrifice many of the nuances that this lovely coffee has.